New technological evolutions in the areas of Artificial Intelligence, Distibuted Ledger Technologies, Bots and Agents, Data Mining, Internet of Services and Things, and more. A extended abstract of an unpublished research paper, on one or more of the key subjects of the Summit, (typically 2000 words + pictures). Academic paper proposals will be invited to form a Special Issue in a well established Journal. An on-site presentation on one the subjects of the Summit (typically 20 minutes, via slides). Usually a presentation based on a new approach, an innovative project or a research outcome. A presentation via skype (10 minutes, slides), as above. Skype presentations are limited to one per session. A position statement at a workshop (5 minutes, talk/slide), in any of the workshops that are in the agenda. Organisation of a new workshop (45 or 90 minutes), on one of the key topics. A hands-on session or tutorial at the summer school (60 minutes, slides/systems). Expect classes of 10-15 students, each with laptop and mobile device. The Samos 2019 Summit will be held in Samaina Inn 4* Hotel in Karlovassi, Samos. Complimentary prices are offered for the Summit Participants, including breakfast, lunches and dinners for the days of the conference. 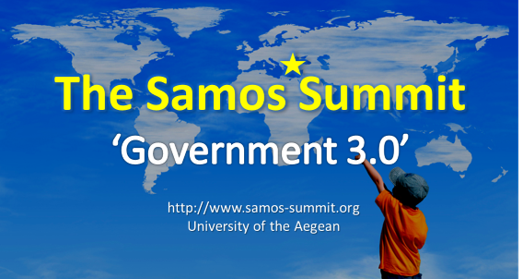 All participants of the Summit have to register and book their accommodation via the Samos Summit website. The 8th Samos Summit will be held at Karlovassi, Samos, Greece, co-organised by the University of the Aegean / Information Systems Laboratory the Manylaws Project and the Government 3.0 Project, funded by the European Commission. Samos Summit is a collaborative, non-for-profit event. There are limited positions for supporting the fee costs for excellent, low income students.